If you’ve never seen a lowland tapir, you’re not alone. Most of the people who live near tapir habitat in Brazil’s vast Pantanal (“the Everglades on steroids”) haven’t seen the elusive snorkel-snouted mammal, either. 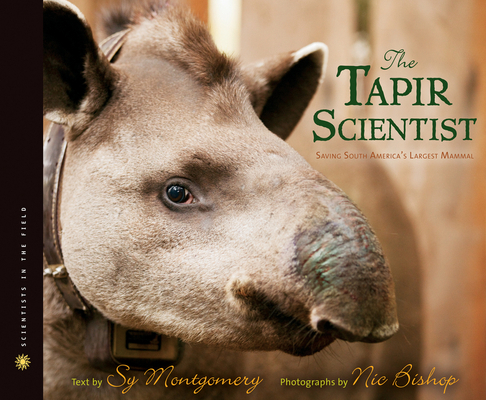 In this arresting nonfiction picture book, Sibert winners Sy Montgomery and Nic Bishop join a tapir-finding expedition led by the Brazilian field scientist Pati Medici. Aspiring scientists will love the immediate, often humorous “you are there” descriptions of fieldwork, and gadget lovers will revel in the high-tech science at play, from microchips to the camera traps that capture the “soap opera” of tapir life. "Profiles of scientists and ranchers, discussions of other animals of the Pantanal, Bishop's typically electric photography, and a few tense moments in the wild combine to create a full, fascinating picture of tapirs and one place they call home, as well as the work being done to protect them." "Chapters about the team's day-by-day experiences, written in a lively, first-person voice, include memorable detail. . . A splendid addition to an exemplary series." "This contribution to the Scientists in the Field series seamlessly blends eloquent text and vivid images to spotlight the gentle tapir and those field scientists whose lives are committed to conserve animal species for the sake of our environment and our humanity." "Bishop's captivating photographs, paired with Montgomery's narrative, not only call attention to a lesser-known endangered species, but also expose readers to the working conditions, obstacles, and emotions experienced by passionate scientists in the field." "[The book] offers a clear-eyed picture of the challenges and the joys of pioneering fieldwork." "Montgomery's dramatic account of tracking the elusive animals is interspersed with scientific information about the various tapir species, samples of Medici's data on tapir movements, explanations of the technologies used in the research, and discussions of Brazilian ranching culture."